At least one part of his body always seems to be in motion! 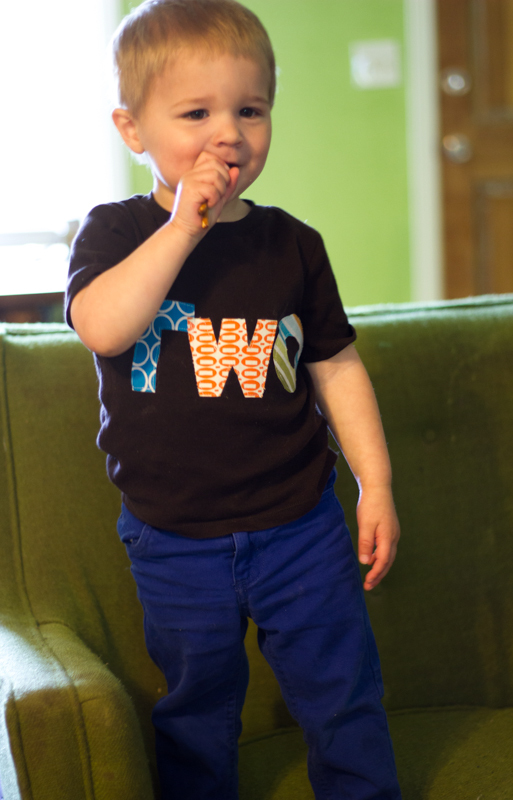 As I was debating what tee to make Thursday, I realized that Oliver “needed” a birthday shirt for his 2nd birthday on Friday. I had a super soft brown thrifted women’s XL shirt that I was saving for an appliqued tee and decided to use that for my shirt base. Once again, I used the trusty flashback skinny tee pattern. Since this was my 4th flashback tee, it came together super fast. I am really interested to notice how the different knit fabrics look different with the same size pattern- because this was really stretchy and soft material, it fits quite a bit bigger than his other shirts. I spent forever trying to decide what kind of birthday applique I wanted to use. In the end, I spelled out TWO on his shirt because now it’s a shirt he can wear the entire year, not just on his birthday. It would have been easier if I had found a font I liked and traced the letters, but I can never do things the easy way so I free-handed the letters and took quite a while getting them just right. I used heat n bond lite to applique the letters to the tee and sewed around them for added security. I really like how this turned out! Of course Oliver did not cooperate super well for our mini-photoshoot but I have a few useable shots for you. Day 5: Oliver’s birthday. I had planned to do a little sewing during his nap but after making his cake and playing with him all morning, I was too wiped out to sew and ended up napping myself. Oh well. 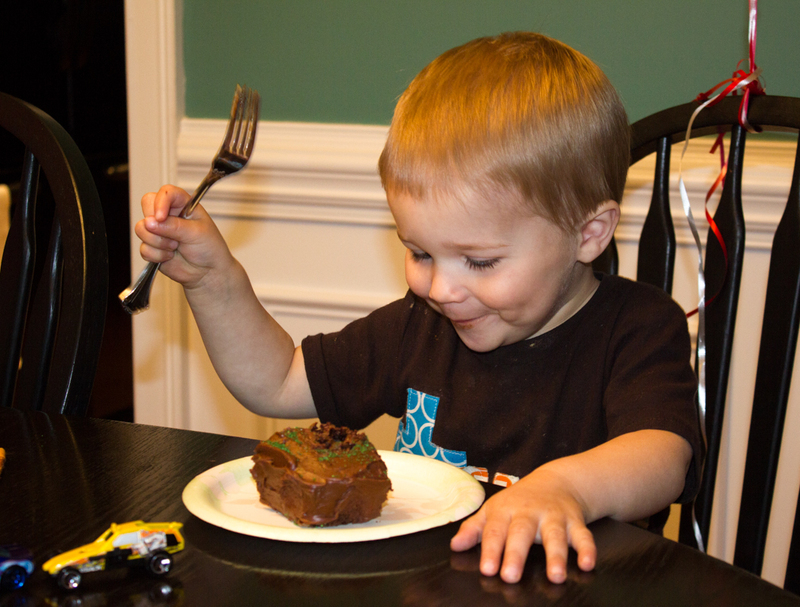 We had a really fun day together and doesn’t that cake look good!? My car loving little man thought it was great. Day 6-7: Had a reaction to something I ate on Friday night and had horrific indigestion/heartburn for 2 straight days….meaning no sewing or anything else for that matter. 😦 Getting ready to get this little brother out into the world so my body can go back to normal- only 5.5 more weeks! I really wanted to complete a pair of shoes for the baby during KCW so I decided it could last one more day in order for me to meet my goal. 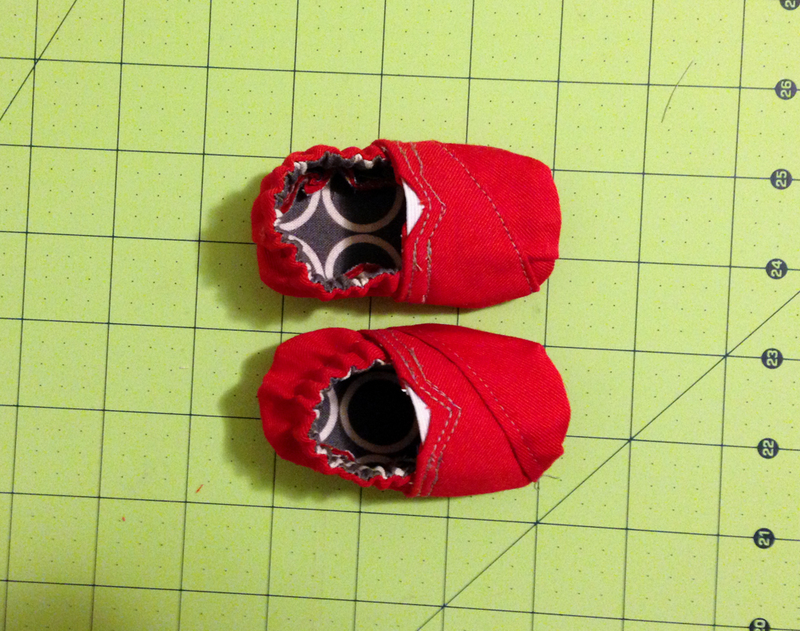 I was going to use the shoe pattern from Handmade Beginnings, but found this adorable tutorial for TOMS and decided I must try it out using my leftover red denim from the boys’ pants. These took forever! I enlarged the pattern to where it should have been a size 6-9 months, but they ended up so tiny I don’t know if they’ll even fit a newborn. Fingers crossed this baby doesn’t have the gargantuan feet his older brother has! I know I’m a bit slow now with my pregnancy brain, but I really did not like this tutorial. I found it hard to follow, and she left out some details that would have been helpful. I also don’t like how it ends up with exposed seams in the inside of the shoe. Seems uncomfortable for a baby. I had to do lots of seam ripping with these shoes because I made so many mistakes, and in the end, I still ended up with 2 left feet. Oh well. Hopefully they’ll fit the little man for a few days at least so I can get some cute pictures. And maybe, I’m just super slow these days and the rest of y’all will have no problems following this tutorial! Let me know if you do try it! 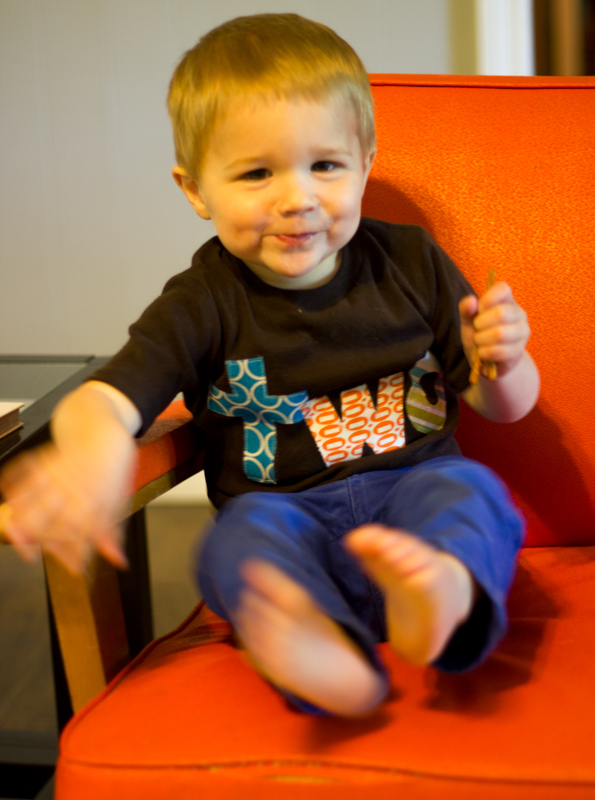 And that wraps up another KCW… Total of 4 tees, 1 dress shirt, 1 pair of quick change trousers, and 1 pair of baby toms. Not too bad of a list in my opinion. This entry was posted in Clothes, Kid sewing and tagged baby toms, flashback skinny tee, kcw, kids clothes week by oliver's fancy. Bookmark the permalink.